The trend for skinny laptops continues unabated, with Dell announcing a new 9.99mm thin Adamo XPS (Xtreme Performance System) computer this week. The details, other than the machines thickness (or lack of it), are currently thin on the ground, with Dell choosing to take the teaser PR campaign route, much as it did with the first Adamo thinbook. 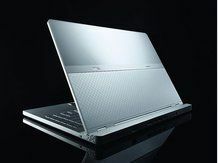 However, when compared with the 19.3mm thick MacBook Air and Dell's original Adamo, which was a whopping 16.5 mm thick, the new sub-10mm machine has piqued our interest. But what's squeezed in between these incredibly thin covers on the Adamo XPS? That's what we really need to know. We also need to know that it is going to be priced at a more reasonable level than the original pre-credit-crunch Adamo range. We'll bring you all the details on specs and pricing as soon as we get hold of them from Dell. For now, if you just want to drool at a picture of the Adamo XPS, check out the Dell Adamo website.